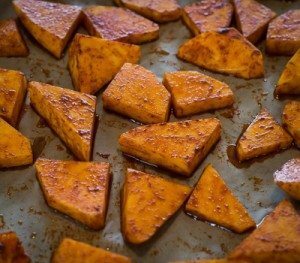 There is something super satisfying about roasted pumpkin, add to that some paprika, garlic and chili and you have got me! 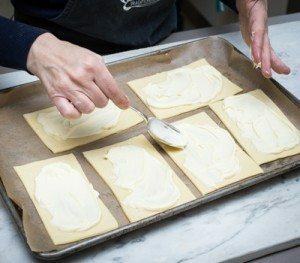 I’ll be the first to admit these tarts are a little rustic looking, or put another way not so pretty, what they lack in looks they make up for in flavour. A while back I was going through a bit of a paprika phase and it featured rather heavily in various dishes across the dinner table. One of our favourite efforts involved tossing chunks of pumpkin in spicy paprika and roasting them, then serving it with big spoonfuls of hummus. 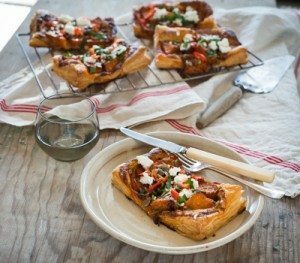 So I decided to take our favourite paprika roasted pumpkin and try it out on a puff pastry tart. Then I was flicking through Ottolenghi The Cookbook (that’s the first one) and found their recipe for Sweet Potato Galettes and got the idea after baking to brush it with garlic infused olive oil – another Ottolenghi idea that’s a winner! It finishes the tart giving it an extra lift. 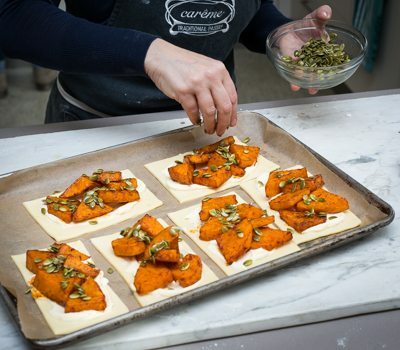 Lastly we love to add a bit of crunch to a dish, be it nuts or seeds, so we topped with pumpkin seeds to finish it but sometimes we use roast almond slivers (roast nut separate to the tart as they will cook faster) – depending on what’s in the fridge. Feel free to tweak or add this dish however you see fit, a dollop of garlic infused yoghurt or hummus is also a winner on top of the finished tart.